For the past couple of weeks, the markets have been going nuts for the dollar on speculation that the Fed is seriously considering winding down its quantitative easing (QE) program. And last night, as Fed Chairman Ben Bernanke testified on the economic outlook and monetary policy before the Joint Economic Committee, they finally got the confirmation they’ve been waiting for! For a moment, it seemed as though Bernanke was going to disappoint the markets, as he began his speech by saying that the Fed may increase or decrease its asset purchases depending on economic data. Remember, the markets have heard these words plenty of times before from Bernanke himself and from other FOMC members, so this didn’t really bring anything new to the table. But soon afterwards, the tone of his voice began to change – he began touching more on the possibility of an exit strategy. In fact, he spent so much of his time discussing a potential withdrawal of stimulus that the markets took it as a sign that the Fed was leaning closer towards scaling back asset purchases. He said that he and his merry men might cut back their asset purchases from their $85-billion-per-month pace “in the next few meetings” if the economy continues to post improvements. He also added that the winding down of QE would be the first step should the Fed begin tightening its monetary policy. Later on, the FOMC meeting minutes provided the markets with further confirmation that the Fed is starting to seriously consider a withdrawal of stimulus. According to the minutes, one Fed member wanted to bump up asset purchases, but “a number” of policymakers wanted to cut back on bond purchases as soon as next month. What’s even more surprising is that one Fed official actually called for a complete stop to the QE program! But many officials seem to agree on one important thing: that they would like to see sustainable progress in the economy before tapering QE. 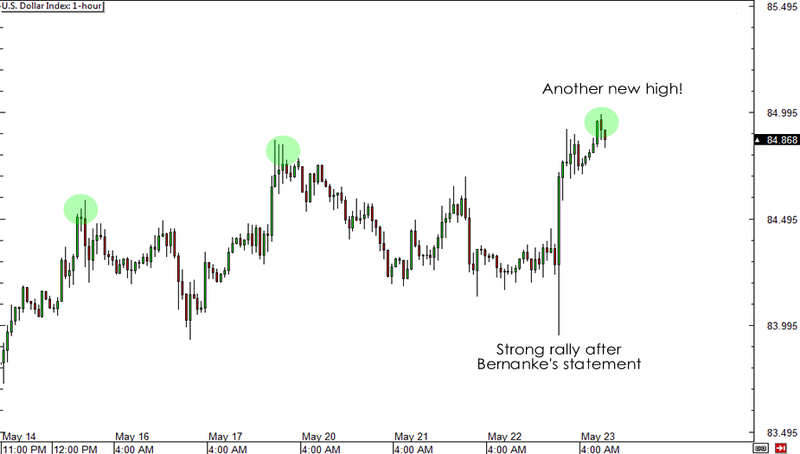 Unsurprisingly, the hawkish tone from Bernanke and the central bank led the markets on another dollar-buying frenzy. The dollar posted tremendous gains across the board, with the commodity-based currencies losing the most. The U.S. dollar index shows how the currency managed to tap fresh highs. Looking ahead, it seems that the coast is clear for further advances for the dollar. But since the Fed has explicitly stated that it will be watching the economy to determine monetary policy, it’s safe to say that the markets will be closely monitoring U.S. data in the coming weeks. More positive results (especially in the job market) would support monetary policy tightening and would likely lead to extended gains for the dollar. But if the economy deteriorates, it could cause the Fed to reconsider its stance and the markets to reconsider their dollar-long positions. How soon do you think the Fed will start scaling back its asset purchases?